I had envisioned an erudite response fitting the educated and theoretical vibe with which I had battered them all morning. Perhaps something like orchestrational and harmonic gestural writing, or tonal consequence, or even temporal textural tautological antiphony…but Curtis was right on. Blues for Pablo is to me the best piece of music on the great Miles Davis/Gil Evans 1958 record Miles Ahead (also titled Miles +19.) It’s a rich and detailed work with much of what Curtis calls music. 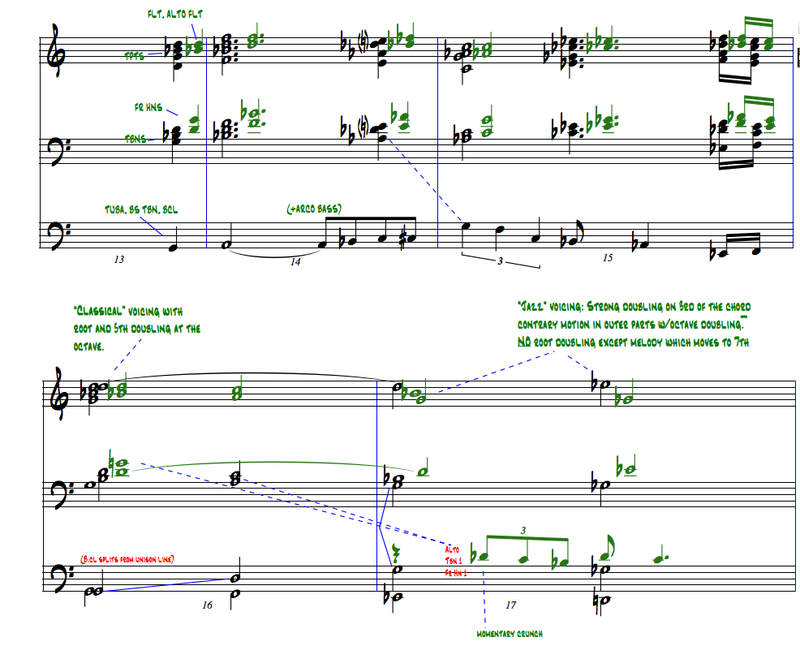 Gil’s techniques–transparent orchestration, use of instruments such as alto flute, french horns, tuba and muted brass, inter-choir unison doublings, cross-doubling, no piano, non-traditional yet balanced voicings—all have become the meat and potatoes of modern jazz large ensemble writing. PS–I just picked up this incredible book: Gil Evans & Miles Davis: Historic Collaborations by Steve Lajoie. Check it out, it’s only 430 pages. Gallery | This entry was posted in Duke Ellington, Gil Evans, Harmony, Jazz Arranging, Jazz Composition and Analysis, Jazz history, Miles Davis, Orchestration, Theory and Harmony and tagged blues for pablo, composition, Harmony, jazz, jazz analysis, jazz arranging, jazz composition, miles ahead, miles davis, music theory. Bookmark the permalink. I am delighted to see that these scores are now available. One of my gigs is to conduct a community band. These are semi-pro players who find Gil’s charts very challenging. The amazing thing is that even though the charts are played imperfectly they still sound amazing. Thanks for this.